Heavy duty one piece welded together design. Constructed of 1/4" Grade 50 steel with a 3/8" thick top bar. Plates are unpainted for ease of welding on attachments. Added cutouts for stronger welding options to buckets and other attachments. Fits all Skid Steers with the Universal Quick Attach mounting system. Easily mounts to your existing attachments. Easily makes old attachments compatible to new loaders with Quick Attach. Plate permits the use of non-universal attachments on skid steer loaders with universal hitch. Plate may be welded or drilled and bolted onto old attachments or used to build custom attachments. If you intend to build your own attachment for your skid steer--absolutely buy this mounting plate! It is precision and quality made for a price that just can't be beat! I have built quick attach items for my 773G in the past--forks and log splitter--but I wish I had known about these plates-- they are more than worth it in labor saving and you get a professionally made foundation for your project. You can tell they are made with pride and you can be proud that they are made in MN, USA. Also, the shipping was lightning quick and FREE! The price listed on the site is what I paid for this item. Be assured that I am not affiliated with KFI--I am just a satisfied customer. Excellent Quality Skid Steer Plate! 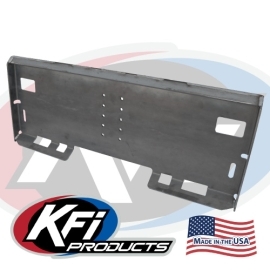 Hi, I highly recommend the skid steer plate from KFI. I have bought several now and the quality is excellent. I have run an equipment business for 20-years in Colorado and know the difference. You'd be hard pressed to find a better skid steer plate for the money. Thanks for a great product KFI!